The lives of 41 D.C. residents who died living on the city's streets this year were remembered in a ceremony at the New York Avenue Presbyterian Church Friday. 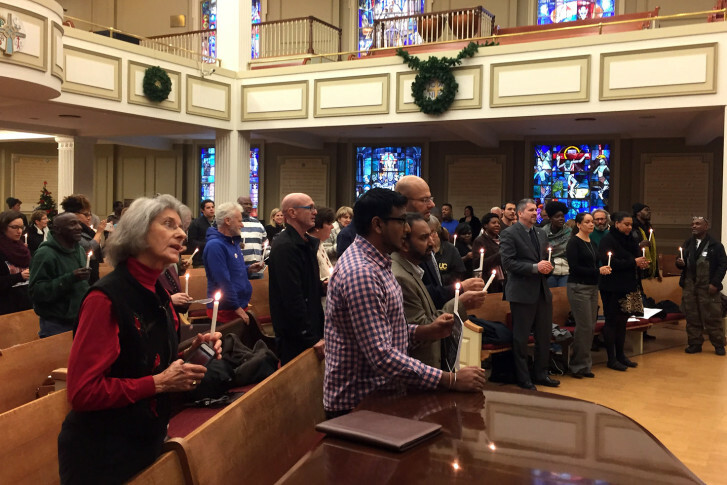 WASHINGTON — After the candles were lit, 41 names were read inside the New York Avenue Presbyterian Church in downtown D.C. Friday afternoon. Each name called out was that of a homeless D.C. resident who died this year while living on the streets. The reading was part of the third annual homeless memorial vigil put on by the People for Fairness Coalition. The D.C.-based coalition consists of advocates for the homeless, many of whom also spent time on the streets. “Our goal is that we never have to do this again,” said Jesse Rabinowitz with Miriam’s Kitchen, which helped to organize the event. Members of the coalition called for more to be done to eliminate homelessness in the District. Many of those taking part in the event showed their support for a plan proposed by Mayor Muriel Bowser that intends to make homelessness rare, brief and nonrecurring by the year 2020. They also called for more to be done in the area of subsidies and housing to get more people off the streets in 2016. “The local government has a part to play, the federal government has a part to play and the individual himself has a part to play,” said Robert Warren director of the People for Fairness Coalition. During this year’s event, attention was also given to the closure of a homeless encampment near the Watergate in Northwest D.C.
“Tents save lives. The reality of it in this city, you are not going to house all the people who need housing,” Warren said. On Thursday morning Warren along with other advocates met with city leaders, urging them to stop what he calls “encampment sweeps” in the District. “Where do you kick the homeless out to, where do they go?” said Michael Craig, who spent weeks on the street several years ago. He says many avoid shelters because they don’t feel that they are safe while staying in them. In the past, city officials have called the campsites unsafe, unsanitary and illegal. Rabinowitz says safety is a big concern for members of District’s homeless community, but it isn’t the only reason people choose not to stay in shelters. “They are also really strictly scheduled. So if you’re working a job, it’s hard to get there in time to get a bed,” Rabinowitz said. There were almost 7,300 homeless people in D.C. this year, according to the Metropolitan Washington Council of Governments.